Ambassador (ret) Lewis Lucke is Senior Vice President for the Middle East and Africa of Grainster LLC, an Arkansas-based company providing an interactive grain-trading platform and ecosphere that connects buyers and sellers of grain worldwide, creating new and enhanced markets without the need for middlemen. www.grainster.com. Ambassador Lucke is also Board Chairman of Fuelie Systems Inc. www.fueliesystems.com, which is developing telemetry-enabled mobile fueling systems for more effective disaster response, medical evacuations and various other applications by helicopters both domestically and internationally. 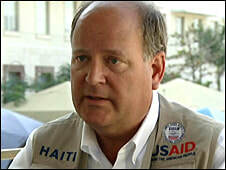 In 2010, he served as lead “US Response Coordinator” for the Haiti earthquake, leading the United States’ $1.0 billion emergency relief and recovery effort. Ambassador Lucke was nominated by President George W. Bush and served as US Ambassador to the Kingdom of Swaziland during the Bush 43 Administration. He served for 29 years overseas with the U.S. Agency for International Development (USAID) and was the first USAID Mission Director for Iraq 2002-2004, where he directed a $4.0 billion reconstruction and economic development program, USAID’s largest program ever and the largest US-financed reconstruction program since the Marshall Plan. He served in the U.S. Foreign Service beginning in 1978 in ten countries: Mali, Senegal, Costa Rica, Tunisia, Bolivia, Jordan, Haiti, Brazil, Iraq and Swaziland. He was USAID Mission Director in Bolivia, Jordan, Brazil, Haiti, and Iraq. Ambassador Lucke has received USAID’s two highest awards, the Administrator’s Distinguished Career Award and the Agency’s award for Heroism. He was named a Distinguished Alumnus of 2003 from the Thunderbird School of Global Management. He received the Secretary of Defense’s Award for Exceptional Public Service in 2004 and is now a successful fundraiser for Iraqi Christian victims of ISIS. He is fluent in French and Spanish and has a working knowledge of Arabic. He is the author of “Waiting for Rain: Life and Development in Mali, West Africa” published in 2000. Ambassador Lucke is from Austin, Texas, married with three grown children. He received a Bachelor’s degree from the University of North Carolina-Chapel Hill and an MBA from Thunderbird School of Global Management in Arizona.